HABA 3977 - Yum, for breakfast, lunch or dinne! 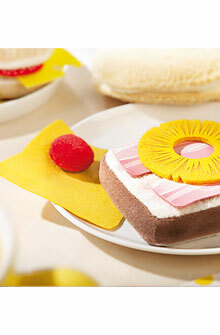 Contains 1 slice of toast, 2 slices of ham, 1 slice of cheese, 1 slice of pineapple, 1 cherry. Fabric food. Toast measures 3.5" x 3.5".